The Agents are out for blood, and they're bringing a sense of humor. Saints Row fans may recognize a familiar face. A new Agents of Mayhem trailer shows off some recognizable agent cosplay. If you thought the last batch of agents had big personalities, wait 'til you meet the Bombshells. Row?" but now I am excited to play in a new world with new characters. 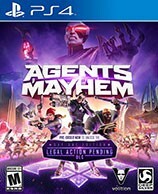 Ji-hoon “Johnny” Gat is coming to Agents of Mayhem as a playable character for those who pre-order the game. Accompanying the trailer is also new information about agents Yeti, Daisy, and Braddock.